Some games are more fun than others. Theme collections of speculative fiction can be tricky things. Especially when the theme is games, which is such a broad subject that finding an overall focus and direction can be fraught with difficulties. Because the genres involved are vast and varied, there's a risk of diluting any theme by spreading it too thin and also, conversely, concentrating too much on any one area so that the collection becomes unbalanced. 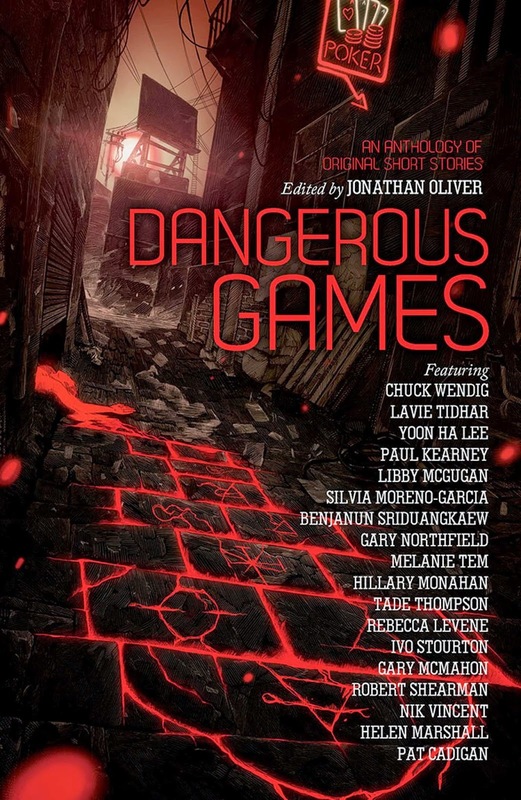 Dangerous Games does a fair job of selecting a group of stories from a diverse swath of SFF, but it definitely felt heavier in certain areas than others, and any overall message was a bit lost in the face of the many different interpretations of the theme that the stories required. With only a few exceptions, the collection could probably be best described as speculative horror. As such, most of the stories are murky, bleak, and a bit unsettling. At their best, the stories approach how the games people play mirror the world they live in. And this can best be seen in Yoon Ha Lee's "Distinguishing Characteristics." My favorite story of the collection, it uses a game as a way of framing conflict, politics, and power. A rich fantasy, it is dark and disturbing and left me craving more like it. The idea of the game was integral to the story and the message it was trying to convey. Much of the collection, though, takes the idea of games in a very different direction, toward torture and death. Perhaps because the collection is never outright billed as horror specifically, I wasn't expecting quite so many stories that featured serial killers or murderers as their main characters. Not that such stories can't be good. "Lefty Plays Bridge" by Pat Cadigan makes a haunting statement over a game of cards, and is both disturbing and begs a close reading. And Hillary Monahan's "The Bone Man's Bride" is equally chilling, a rural horror about a community willing to sacrifice its children for their own prosperity. And those stories, at least, still featured games prominently, as part of the story they were telling. After a dozen stories featuring murderers, though, it got to be draining to read. More appreciated would have been the inclusion of more stories that were uplifting and hopeful, like Libby McGugan's "The Game Changer." Of course, for all that it was a breath of fresh air, the game aspect of the story, like many in the collection, seemed a bit tacked on. It wasn't really vital to the story, and the story really wasn't about games at all. Still, it was nice to have a happier story (even one that was primarily about a child with cancer), because even with it the collection as a whole came off as quite dark and hopeless. For fans of horror and dark fiction, there's quite a bit to like, but for anyone else this might be a rather difficult book to read for long stretches, and probably won't leave anyone more hopeful about humanity. I would also have liked to see the collection stick more to its espoused theme. Each story comes with a short introduction from the editor that basically justifies its inclusion, but for some of the stories I found the explanation a bit of a stretch. Yes, playing with emotions can be like a game, and yes Civil War reenactment is like a game, but I didn't feel that it was enough to merit inclusion into a collection about games. There were also a few stories where the games were only incidental, where a game was present but had no real effect, and wasn't really what the story was about. While it's not a testament to the strength of the stories, it did distract me, and overall made me enjoy the collection less because of it. Individually, the stories of Dangerous Games are pretty strong. Many are very good. But I think the organization of them makes the collection feel unwieldy. There were a few I thought were too similar, where the story is all building toward the reveal that the narrator is a serial killer or where the game included is really about killing someone. And while I still enjoyed some of those stories, I got tired very quickly of so many circling around the same ideas, which didn't always do anything interesting or challenging with games. Too many seemed shoehorned in, to the point that the overall message of the collection was muddled. As I said, having a theme collection can be quite tricky, and while I enjoyed many of the stories, this one left me a bit tired. Bonuses: +1 for some clever uses of games across multiple genres. Negatives: -1 for too many serial killer/murderer stories, -1 for having a number of stories that didn't fit well with the theme. POSTED BY: Charles, avid reader, reviewer, and sometimes writer of speculative fiction. Contributor to Nerds of a Feather since last month (so 2014).